When it comes to making the necessary adjustments for a future in which energy usage and cost is expected to rise globally, the strategies are usually to go small. Smaller cars and houses must be designed in order to allow for an increasing global energy demand, but when it comes to offshore wind energy production, it appears that going bigger is better. A five year European project named UpWind beginning in 2006 comprehensively examined the feasibility of constructing and installing cost efficient turbines capable of generating up to 20 megawatts (MW) of power, which is significantly higher than the current maximum installed turbine capacity (Upwind 2011). The UpWind project consisted of 48 experts in wind energy generation from both the private and research sectors. The results of the project were published in a March 2011 report that detailed the necessary adjustments needed in everything from construction to installation of these “mega turbines” as well as the technological innovations that will be required to make these turbines economically as well as structurally feasible. After examining all aspects of installing a 20MW turbine, UpWind determined that although current infrastructure would not allow it, technology exists today that would allow a turbine of that size to function. However, complex cost-benefit analyses must be completed to determine the economic feasibility. 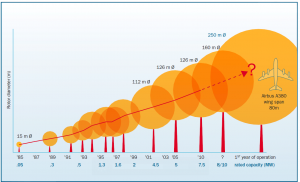 The virtual turbine designed to generate 20 MW would have a diameter of 250 meters, which is significantly larger than the second largest turbine conceptualized to have a diameter of 150 meters (projected to generate 10 MW). UpWind identified the challenges of implementing a turbine of this size, primarily mounting an 880 ton structure on a tower. Currently, no vessels or cranes are large enough to handle such a large structure. Also, support structures large enough to hold a turbine of that size are impossible to mass manufacture at this point (UpWind 2011). 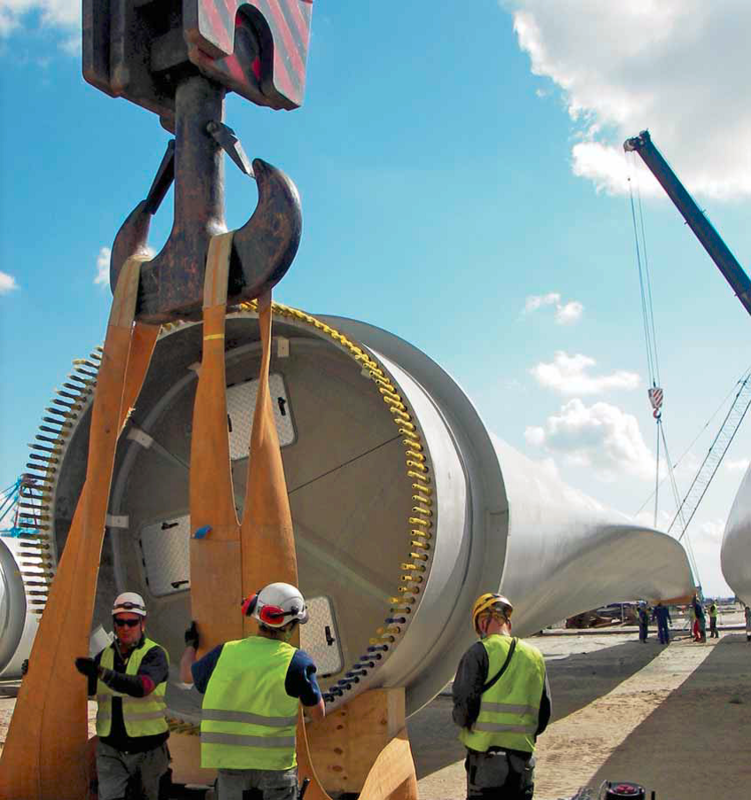 UpWind developed methods to construct a blade in two sections in order to make it easier to transport and install. 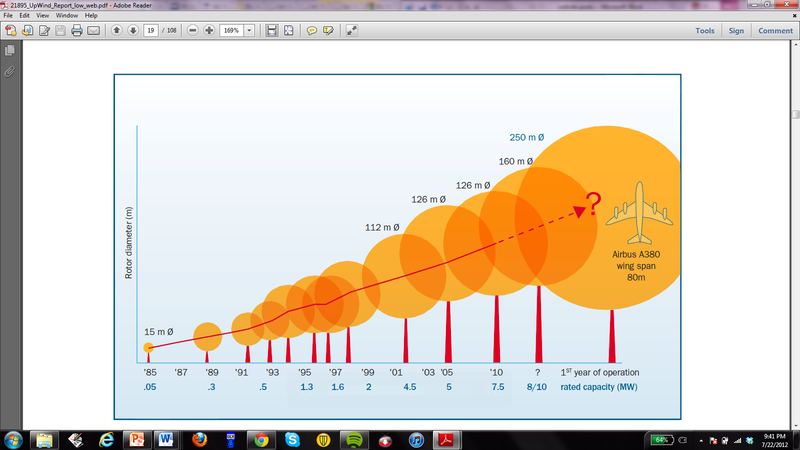 Another important consideration when designing mega turbines is the decreased aerodynamics of an object of such a size. Researchers at UpWind designed and tested multiple innovations that would reduce the fatigue load of a turbine blade approaching 125 m in length. These innovations involve manipulating the blade to capture the most energy from the wind. UpWind demonstrated that blade control devices such as trailing edge flaps, camber control, and synthetic jets in conjunction with software controlling the blades could reduce fatigue load by 20-40%. For more information on these technologies, see http://windpower.sandia.gov/other/084809.pdf. With wind farms containing turbines large enough to generate 20MW, there is a significant wake effect that hinders the energy generation of turbines not in the front row. According to Rebecca Barthelmie of UpWind, wind farms in excess of 500 MW can lose up to 20% of power output due to wake effects. UpWind examined multiple innovations to minimize the wake effect and streamline the system. One technique developed to reduce the wake effect is to reduce the power output of the turbines in the front row. This makes these turbines more “transparent” to air flow, thus allowing other turbines to capture more wind energy. Another technique to make wind farms more efficient is the use of Light Detection and Ranging (LIDAR) to detect gusts of wind before they reach the farm so the blade control devices identified above can adjust to maximize power output. LIDAR is beneficial because with turbines so large, incoming wind cannot be seen as an “inhomogeneous phenomenon” and multiple points must be measured. Although at this point in time, mega turbines such as the ones studied in the UpWind project cannot be constructed, more and more evidence is suggesting that this is the way the industry is headed. While UpWind did much research on the economic and technological feasibility of large turbines, further research must be completed on the environmental impacts such large turbines may have.